Here at Life As Alice, I like to bring you stories and articles of places in which you wouldn't necessarily hear about unless you knew someone in the know. Think of me as your person who doesn't know much but is actually in the know. So when I read this press release that popped into my inbox I thought I'd let you in on the secret that is, Es Saadi Gardens & Resort. 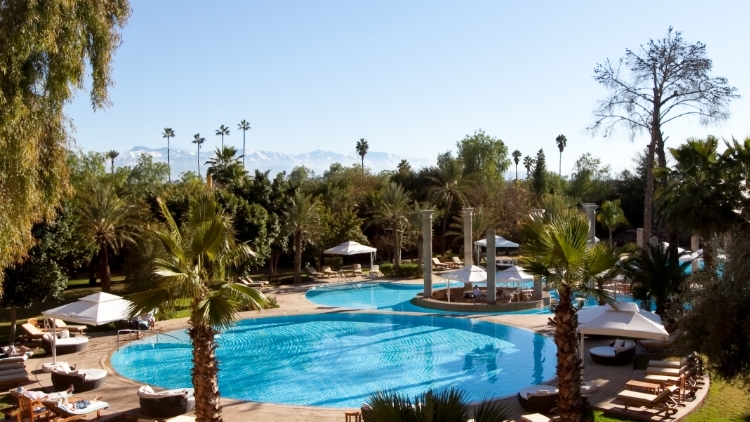 Es Saadi, meaning “le Bienheureux” “The happy one”, was created in 1966 when it opened a hotel with a Casino, The “Casino de Marrakech” in 20 acres of stunning park was designed by its owner and founder Jean Bauchet. Then, as now, Marrakech was the place to escape the European winter and the chic area became known as ‘Hivernage’. In the height of the swinging 60’s the hotel played host to Princess Margaret, Pierre Balmain and The Rolling Stones. The hotel resort has been passed down through three generations of the Bauchet family, Elisabeth Bauchet-Bouhlal opened the Hotel with her parents, and today her son, Jean-Alexandre Bauchet-Bouhlal and his wife Caroline lead the management of the resort. Situated in 20 acres of beautiful gardens, the Palace Hotel and the 5 * Hotel both share the tranquil landscape. The Palace has 92 suites and 10 private luxury villas with their own pools dotted around the gardens, as well as 8 Ksars which are smaller two-storey Berber-style houses near the pool. The 2400 square metre lagoon-swimming pool is the largest in the city, with a huge palm tree right in the middle. The Es Saadi gastronomy is well known and the Resort has six restaurants including L’Epicurien at the Casino, which is one of the best restaurants in the city, with live evening performances; the feeling is not dissimilar to Ronnie Scotts, but with the advantage of large terraces to sit out on in the evening. The Palace’s 3000 sqm Spa has a Dior Institut, one of only two in the world. Es Saadi is also the home to the Casino de Marrakech which was the first-ever to be built in North Africa in 1952, and the TheatrO Nightclub once graced by Josephine Baker which today plays host to top DJ’s from around the world. The Es Saadi is set in the Golden Triangle of Marrakech, and its Palace Hotel is built among 20 acres of beautifully landscaped gardens facing the Atlas snow-capped mountains, only a short stroll from the bustling souks and Djemaa el F’na square, creating a perfect oasis to escape the crowds, whilst still being in the heart of the city and in the heart of the action. The Palace Hotel is a luxurious haven, and after a hectic day in the Medina there is no better place to unwind than in the gardens planted with palm, banana and orange trees, with sun loungers surrounded by roses, bougainvilleas and bird-song. The family are still completely on-hand day-to-day at the property, and boast long-standing friendships with their long standing customers, and a personal service is at the core of their ethos. They are also keen supporters of local artists, and have a large collection of over 400 pieces of Moroccan Contemporary Art including paintings, sculptures and frescoes from a range of established artists and young, emerging local talent, collected over time by Elisabeth Bauchet-Bouhlal. In 2014 she was decorated for her pioneering enterprise as an Officier de l’Ordre du Wissam Alaouite, by HRH King Mohammed VI of Morocco. The overall design of the historical 5* Hotel at Es Saadi has kept the original feeling of refined elegance and style of the 1950’s and 60’s. All the rooms and suites have been entirely renovated and are both comfortable and authentically Moroccan with sculpted wooden furniture, Moroccan silks, local colour palettes and hand-woven carpets. The 5* Hotel, a short golf-buggy ride away, has its own pool and has 135 rooms and some suites, all decorated with an eye towards both comfort and authenticity, with sculpted wood furniture, Moroccan silk fabrics and hand-woven carpets. In everything, the Bauchet’s philosophy preserves the family atmosphere and conveys the charm and soul of this special property. This is a resort which looks big, but feels small: a family chain - not a hotel chain which is a bonus in this day and age.